So that’s where the story ends, for the time being at least. We had run up against the fact that England is very much still the ‘green and pleasant land’ that we imagine it to be. In the furore around the proposed forest sell-off, and later in the consultation on the National Planning Policy Framework, well organised and vociferous lobbying groups successfully exploited our fears about ‘concreting over of the countryside’. But most of us don’t realise how well-protected our countryside actually is, and how much of our small island it covers. Planning Minister Nick Boles’ recent pronouncements on green-field development have raised this issue afresh. Firstly, I think things like this are always ‘better out than in’, indeed that is a driving rationale for all of Ruralise. If you have read this and found it interesting or even useful, it will have been worth-while. If it prompts any thoughts, do please let me know. And secondly, after the effort that went into getting Forest Village as far as we did, it feels good to draw a line under it…for the time being at least. Because in signing off on Forest Village, I can’t resist leaving the door ajar. It’s worth noting that our site search was fairly crudely done and based only on the Forestry Commission estate, which accounts for less than half of England’s coniferous forest. As I said at the start of this series of posts, if you are a land-owner with 150 hectares of softwood plantation not covered by any restrictive planning designations (SSSI, AONB, etc) and located near to transport infrastructure in an area of high projected housing growth…do get in touch! 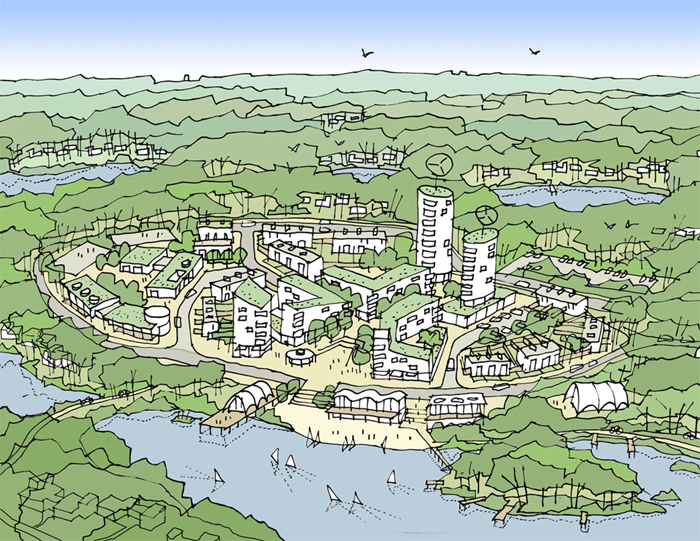 This entry was posted in Architecture/Design, Development/Land-Use and tagged development, Forest Village, Forestry Commission, Garden City, land-use. Bookmark the permalink.